On April 5, 1908, little Ruth E. Davis was born in Massachusetts. Always strong-willed and determined, she eventually became a great actress in many classic films and even on stage. She is iconic, an inspiration. Her self-esteem is its own legend and her willingness to be forthright and not at all shy about voicing unpopular opinions must have been very liberating. She’s our chosen face of Sneer Campaign, and we reference her in our daily lives as much as we can. This brings us to this day, one of the most important religious holidays for us. Although celebrated around the world, the suggested activities are somewhat new and traditions are still being formed for St. Bette Day. However, there are some things that are always appropriate. You can do one of these, or do them all in a whirlwind that other people will have to remember for you because you’ll be having too much fun. You’ll have to just remember April 6th, the Day of the Strangely Satisfying Hangover. No regrets! Invite your friends over for an evening of films, music of the 1930s, gin drinks, and fancy clothes. Dress as a character from one of her films or as Bette herself whenever she needed to stroll the red carpet or accept an award, or dress in her casual styles. 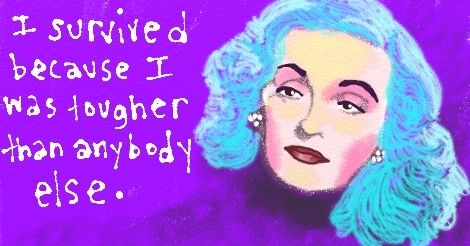 You may go as Bette when she was young or when she was old. Use wigs or go for one of her amazing hats. Be sure to stay in character! And don’t forget: Men are always welcome to dress up as Bette Davis – she was the favorite of female impersonators for years. That was when she knew she had really made it as a star. 1962 What Ever Happened to Baby Jane? Channel your inner Margo Channing and imbibe gin martinis, very dry, in truly heroic amounts. It is important that the martinis remain just as dry as your commentary, snide insults, and catty jokes at the expense of friends and guests. Before your very first sip, declare to everyone around you (even if your only company is your reflection in the mirror) that they’re in for a bumpy night. Remark early and often that things are going to get worse for everyone except for you. Proceed to alienate and to burn bridges. It is what she would have wanted. As most of you probably are aware, Bette Davis has played some pretty demanding roles where she is a terrible human being. Several times, she has thrown award-winning tantrums and rages all for the audience’s delight. It is safe to say that Bette was drawing from real life experience, and that makes us shake with joy to know that this almost certainly has to be the truth. Today, on this holy day, fly into a fury. Go blind with anger and lash out, verbally, at anything and anyone around you. Throw some dishes against the wall. If you don’t care to break your dishes, resort to lamps, vases, big old style rotary phones, empty bottles of gin, or assorted trinkets. Blame everything. Later, you can form the rubble into an altar and pray at it for the rest of the year. Place a movie still of Bette at the top and once again, let self-satisfaction wash over you. 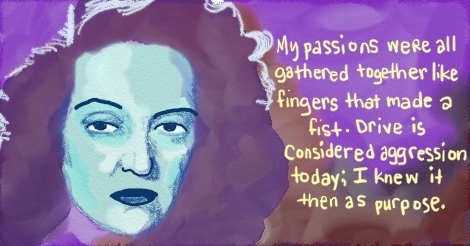 Bette Davis is well known to have been a very driven woman. Just read any of her quote lists, they are full of statements about how she gets what she wants because she is strong enough to get it herself. So be like Ms. Davis today and do whatever it takes to reach your potential. Don’t even walk anywhere – always stride! Don’t look at anything – glare at it. Don’t express disapproval – tear it down! Do everything in absolutes including absolutely having zero remorse about any of it. Then feel pleased with yourself and give thanks to Bette’s angel up above. Lately, we have been in the throes of watching that series, Feud, which is all about the time Bette Davis and Joan Crawford starred in Whatever Happened to Baby Jane? However, their animosity stretched back to the beginning of both of their careers and lasted for decades following the release of that film. They genuinely didn’t like each other, so we advise that you research this piece of delicious history and eat up the things they publicly said about each other. Then, fueled by the fire in their words, you can select a person in your life that you don’t particularly like and go for it. Be sharp. Cut with your epithets. And never even for a second ease up on your opinion, unless there’s a chance that if you work together on a project, you could both earn money and admiration. Then, just be terrible to each other in slightly quieter tones. You can do it!